Normal mission: Escape the digital realm! 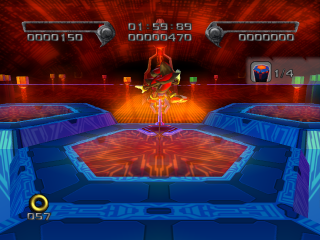 Mad Matrix is one of five possible fourth levels of Shadow the Hedgehog; in the game's branching path structure, it follows from taking a more heroic, GUN-aligned path through the previous levels. With Chaotix's assistance, a digitised Shadow the Hedgehog breaks into the Eggman Empire's virtual mainframe - to find it already under cyber-attack by the Black Arms. Navigating a vast and confusing network of electronic pathways, Shadow once again has to dodge through evil vs. evil crossfire in his search for information about his genesis. After either assisting Charmy Bee in stealing the five disks on Prison Island, or simply retreiving the Chaos Emerald from Circus Park, Shadow enters a part of one of Dr. Eggman's bases, to find Espio the Chameleon, Vector the Crocodile, and Charmy attempting to hack into a computer. After helping them complete the hack (by smashing the keyboard), Shadow finds himself in the Blue Network of Eggman's Mad Matrix, and plans to go to the core because he believes "the Doctor must know something". Inside of the 'Blue Network', Espio asks Shadow to help him extract data from all 4 terminals. Just outside the blue terminal, Doom's Eye informs Shadow that bombs have been set along the circutry, and instructs Shadow to detonate them all, as this will destroy the Doctor's mainframe. Throughout the level, Espio instructs Shadow to leave the Egg Pawns alone, lest they attract the notice of not just antivirus programmes, but the fat man himself. Whichever route Shadow takes, Eggman eventually does identify the intruders, and blasts into the cyber-realm himself atop the Egg Breaker. Mad Matrix is a cybernetic realm not disimilar to Digital Circuit. The key difference is that it is Eggman's mainframe, rather than G.U.N. 's, and as a result, Egg Pawns guard it rather than G.U.N. Beetles. The layout of the stage is colour-coded into four distinct areas. Throughout the stage (mostly in the main area), there are strobe poles that can be knocked over and used for an electrifying head bashing. The Blue Tower is the entrance to the Mad Matrix. It is built of mainly blue and purple blocks, with giant yellow versions of Security Wall Panels forming the side walls. There are also floating red crystals on purple pedastals that can be broken with a punch. To top it off, red and yellow strobe-like lights can be found on the walls and floors. The security consists of eight Eggpawns wielding blasters, four yellow Security Crystals, and two vertical lasers guarding the path to the blue terminal. The largest part of the stage, the Main Area is where you can find the entrances to the Red, Yellow, and Green Towers, as well as the exits from the Yellow, Green, and Blue Towers. The most notable feature is the 'mini-tower' in the center, which is two-toned yellow and green, split right down the middle. Using the Blue Tower as a generic 'South', the Blue Circuts spread out across the south part of the map. The Blue Network holds a Hero Light Orb and various Black Annilieds. 5 bombs can be found here. To the west of the stage is the Yellow Network, which is mostly to the western side, but reaches in to the center and up to the north as well. A firewall can be found here, along with a 'loop circuit' that spills into the Red Network. 9 Bombs can be found here, one of which is shared with the Green Network. To the north is the Red Network. The Red Network is clumped up at the top of the map, unlike the Blue Network which is more spread out. Also, unlike its counter part, the Red Network reaches towards the central 'mini-tower'. The Red Network is defended by two firewalls. 8 bombs can be found here. Following the order of the Checkpoints, The Yellow Tower is the second one to be entered, through a Warp Hole. The interior is composed of yellow and orange blocks, has yellow strobe-like lights forming the 'walls', and contains a circuit that leads to the terminal. The Yellow Tower is guarded by two Eggpawns with lances, four with blasters, and four vertical lasers. Next in line is the Green Tower. The interior is made up of green and teal blocks. There are also green and red strobes making up the walls, as well as giant yellow versions of Security Wall blocks in one area. Also, the same red crystals that were in the blue tower can be found here. Security here is made up of six Eggpawns with blasters and a moving floor/barrier trap. The final Tower, the Red Tower is where Shadow would go regardless of whether or not he is helping Espio. The interior is made up of red and violet blocks, and has a sloping entry way, in contrast to the Warp Hole entrances to the Green and Yellow Towers. Also in contrast to the Green and Yellow towers, the Red Tower has a Warp Hole exit near the terminal, in case the Yellow or Green Towers were skipped over. The Red Tower has strong security, including four Blaster Eggpawns, a Red Security Crystal, and an incredibly difficult to reach terminal. The Secret Door is located on the two-toned 'mini-tower'. Inside is a circuit leading directly to the Red Tower. This page was last edited on 16 December 2017, at 19:11.